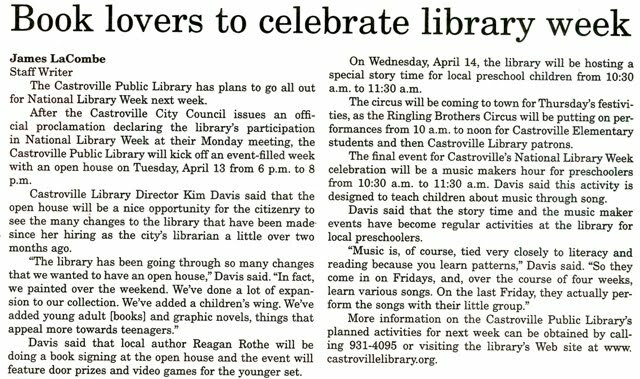 Last week the Castroville Public Library celebrated Nation Library Week with a number of activities. After Mayor Bob Lee, seen here with Library Board president Mike Estes, officially proclaimed the city's participation on Monday. 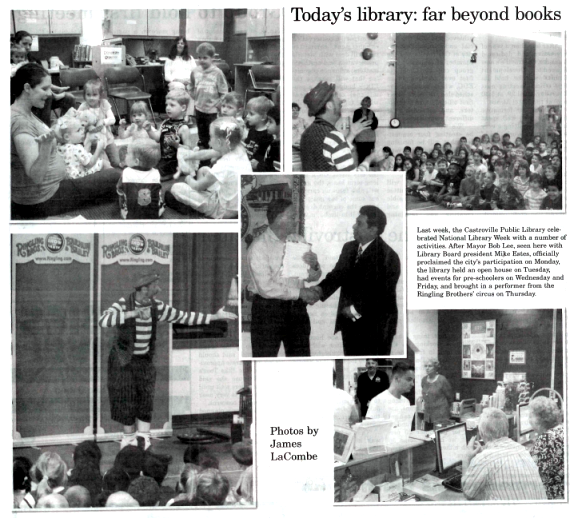 The library held an open house on Tuesday, had events for preschoolers on Wednesday and Friday and brought in a performer from the Ringling Brothers' circus on Thursday. 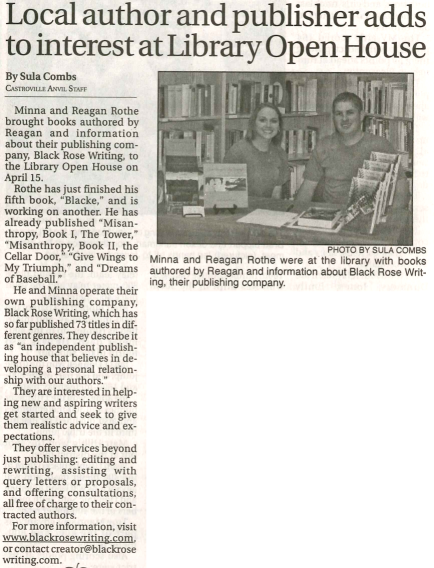 Article From The Castroville Anvil. 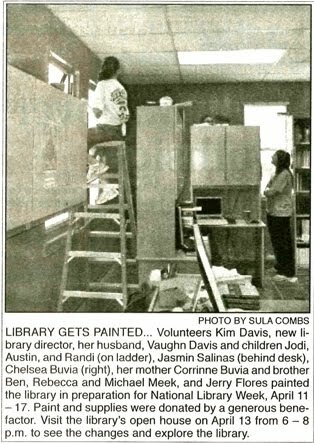 The last time the Library received a makeover was back in 2007 when the Chamber of Commerce moved to a new site and allowed the Library to take over the whole building. Architect Egan Gleason designed a new layout for the library that made more efficient use of space and lighting to produce a more aesthetic look and feel to the library. Now the Library is changing once again. All the books for children have been moved together in the back to create a Kiddy-Corner. The reference and Texana moved over by the computers, fiction and non-fiction are now side by side. The VHS tapes and audio have been moved together by the computers. The Local, German and Alsatian History books and records have been moved to the back room. Those who wish to study may ask at the front desk for access to the back room. The young adult section is next to the Kiddy-corner, and has grown significantly by more than 50 new titles. This growth includes graphic novels, comic books, vampire stories and more. A poll was taken among high school and middle school age children to determine what would interest young adults. 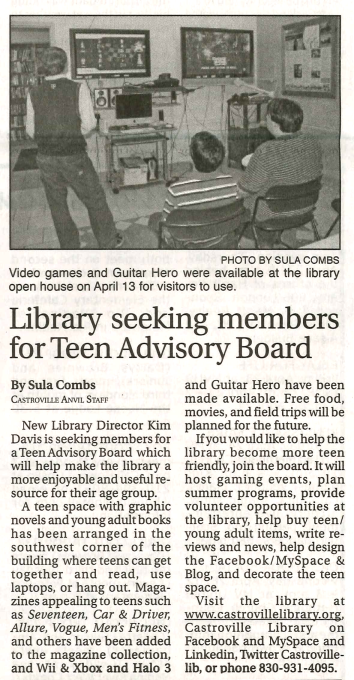 Based on the results the library is currently seeking to purchase more books geared toward teens and young adults. The library has a new paint job. The front desk, the back room, and the director's office are now beautifully colored in purple, red, blue, and orange. Come by the Library and see all the great changes for yourself.